If your travel plans for 2019 include a trip by campervan, feast your eyes on the Nimbus – a hybrid electric people carrier that combines styling elements of the iconic Airstream trailer and VW kombi van to produce a design far more radical than anything on the market today. 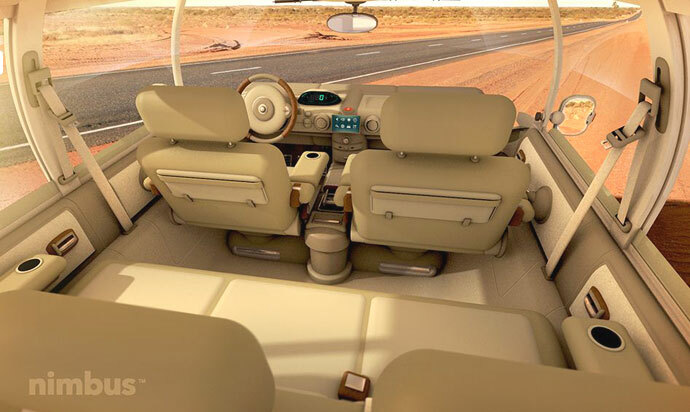 Boasting far more window area, interior space and ground clearance than any SUV, the Nimbus hybrid design has a 130 Kw (180 hp) motor charged by a micro generator, which between them deliver the equivalent of an estimated 200mpg. The dash features a removable internet-enabled touchscreen and passengers get a fridge big enough to hold eight cans of drink. Concept designs like the Nimbus have a habit of staying on paper. Sometimes, you’re best off building your dream campervan yourself. 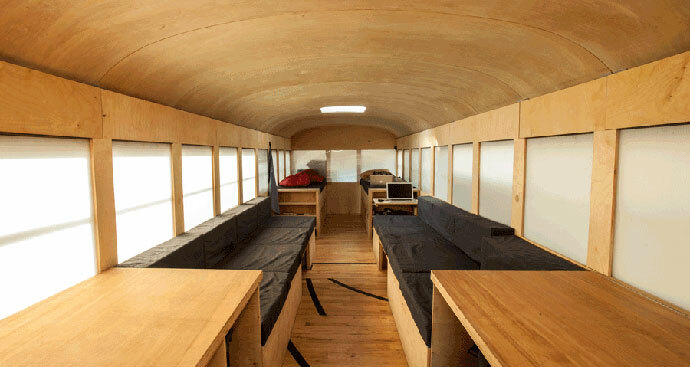 Hank Butitta wanted to work at full scale for the final project of his Architecture masters at the University of Minnesota, but unable to fund the building of a conventional home he bought the bus and converted it into a tiny living space. The American school bus cost the equivalent of £2,000 and had further £4,000 spent on improvements – a modest budget that resulted in an incredibly versatile living space. This 1956 Commer one-time fire engine has literally been put out to pasture in the grounds of Inshriach House in Scotland. Featuring a reclaimed oak parquet floor, a salvaged snooker table slate to make an upcycled hearth for the wood burning stove and a brass Victorian double bed, the camper van can be rented by the night via the Canopy & Stars website. 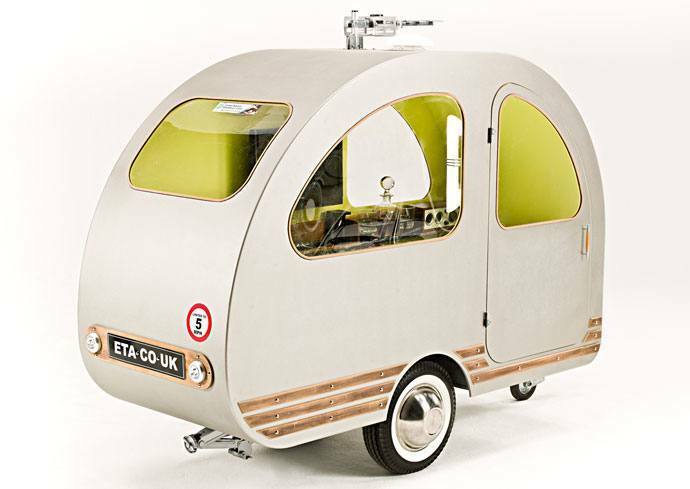 A designer best known for his custom car creations built this tiny pedal-powered camper van complete with four seats, a cooker, sink, table and bed. Andy Saunders mounted cannibalised bodywork from a Bedford Bambi van to a four-wheeled pedal cart to create what he calls a ‘cramper van’. 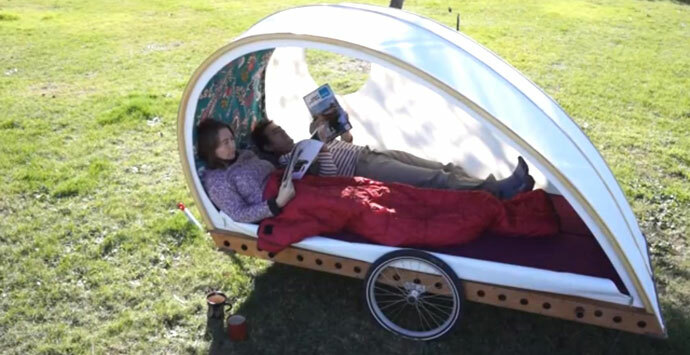 The Tricycle House is pedal-powered recreational vehicle (RV) similar to the Cramper Van, but offers even more comfort because it boasts its own bath and shower. Each piece of the tiny house is made from lightweight plastic that has been cut with a CNC router, scored, folded and welded into shape. 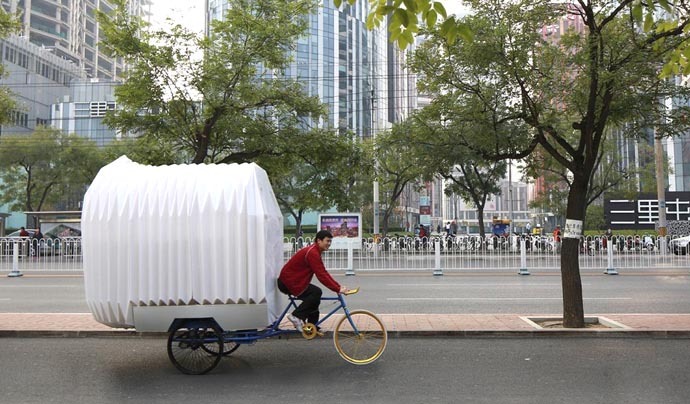 The polypropylene plastic bodywork can expand like an accordion to create more space, and connect to other houses. The translucent plastic allows the interior to be lit by the sun during the day or street lamps at night. 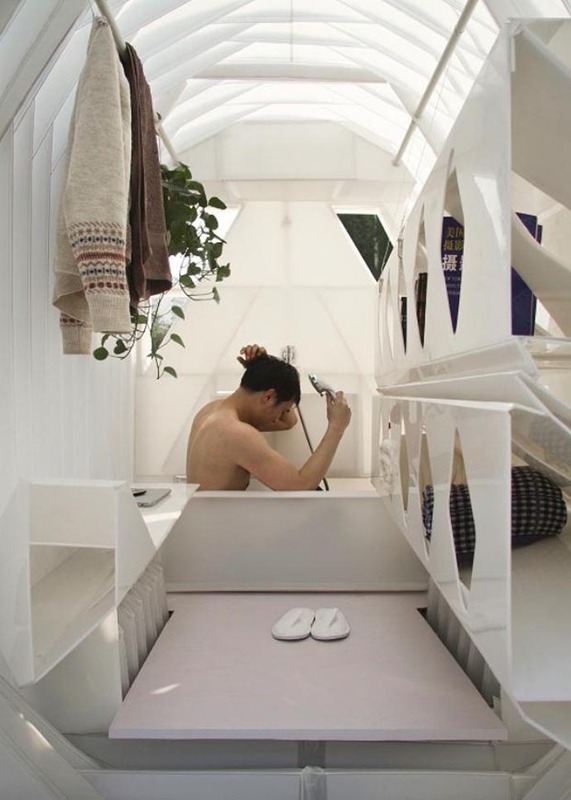 The sink, stove, and bathtub are collapsible and stow away at one end of the tiny home. 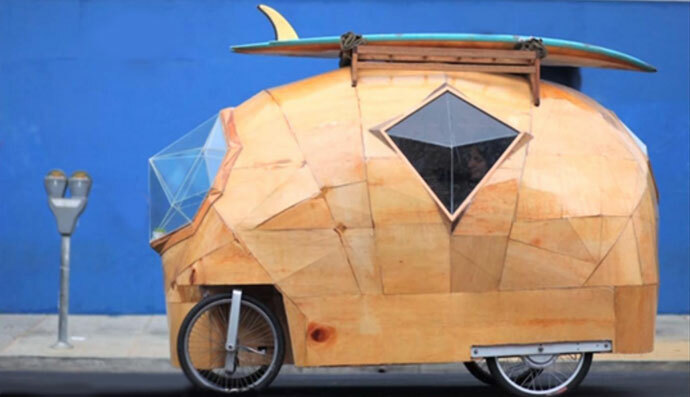 Jay Nelson combined his love of cycling with stuff he had lying around his house to build Golden Gate – a tiny mobile camper big enough to carry two surfboards on its roof and enough gear to stay away for a weekend. The steep hills around his home town of San Francisco meant he soon upgraded to a small electric motor with a range of 10 miles and a top speed of 20mph. A French boat building company last month unveiled the Foldavan – a lightweight camper that collapses for easy storage and towing. Wooden Widget already produces a range of collapsible boats and sailing dinghies that can be towed behind a bicycle and the Foldavan shares many of the same design principles. Built from wood, carbon fibre and reinforced PVC cloth, the teardrop-shaped Foldavan has three modes. When being stored, or transported on a car roof rack, it collapses flat. While being towed by a bicycle, it opens to 60 cm – about the same as the width as most handlebars. Once at its destination, it takes less than five minutes to transform the Foldavan into camping mode. The QTvan is a caravan rather than a campervan, but since it’s our design, it gets a special place on this list. 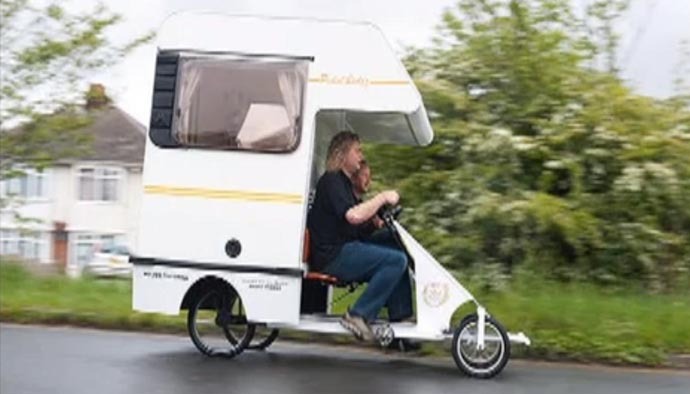 Now holder of the Guinness World Record for smallest caravan , the QTvan is towed by a bicycle. It’s tiny interior sleeps one and crams in a television, radio and drinks cabinet. The Good Shopping Guide each year reveals the good, the bad, and the ugly of the world’s companies and brands, with a view to supporting the growth of social responsibility and ethical business as well as a more sustainable, just society. Beating household-name insurance companies such as John Lewis and the Co-op, the ETA earned an ethical company index score of 89 – earning us a joint-first place with Naturesave. The ETA was established in 1990 as an ethical provider of green, reliable travel services. 29 years on, we continue to offer cycle insurance, travel insurance and breakdown cover and home insurance while putting concern for the environment at the heart of all we do. Where will you travel in 2019? If available at what price?